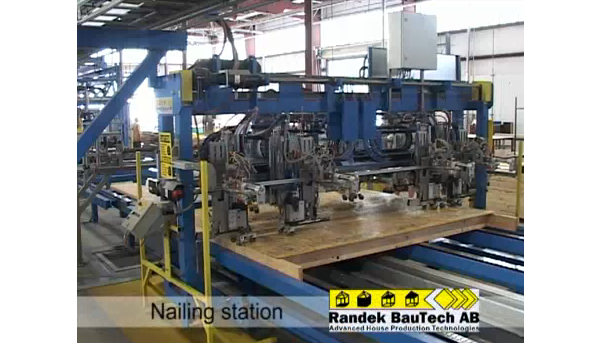 We've looked at Swedish examples of an automated panel building line, and a largely manual panel building line, but how about in the USA? 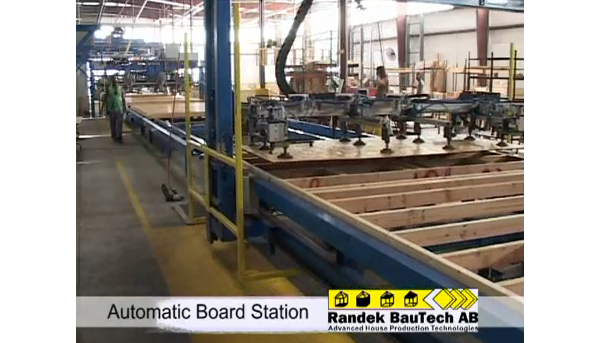 There are some manufacturers here that have imported these machines and run automated panel building lines. The difference? The Americans do not do closed panels, meaning panels finished inside and out. In fact they don't finish them at all. Well why not you might ask. If they are buying the machines from the same company that makes them to build finished closed wall panels, then why don't the American companies do the same thing? The obvious answer is that the rest of the construction materials that need to be incorporated don't lend themselves to being installed off site - this was the focus of many of our earlier Letters from Sweden posts (read back to see the detail). Hence the effort to build closed panels here becomes more difficult, expensive, and finally does not offer an advantage over completing the walls on site. Another aspect of why it makes less sense here is the quality of the construction in Sweden. The typical wall construction in Sweden is much more substantial, many more layers to the wall assembly, and many more steps to complete a wall. Hence if those steps are automated or made more efficient there is more opportunity to build value in the closed panel process. The cheap and thin wall construction we use here does not offer as much chance to save effort. So what we are about to look at is an American panel line. There is no identification but I believe this to be one of the larger merchant home builders in the US. 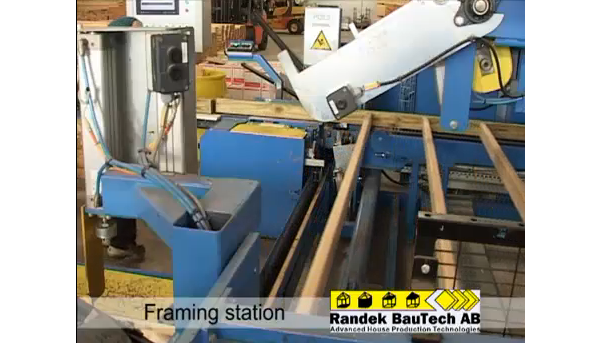 Without a doubt this company knows how to build houses profitably, and the fact that they are using a sophisticated automatic panel framing line like this is impressive and speaks to the sophistication of these large US builders. They likely also own a truss fabricating line for making their own roof trusses rather than purchasing them from a third party. They have in their own way squeezed as much waste out of their process, and are generating as much profit as they can by adopting these methods. Lets look at the line. 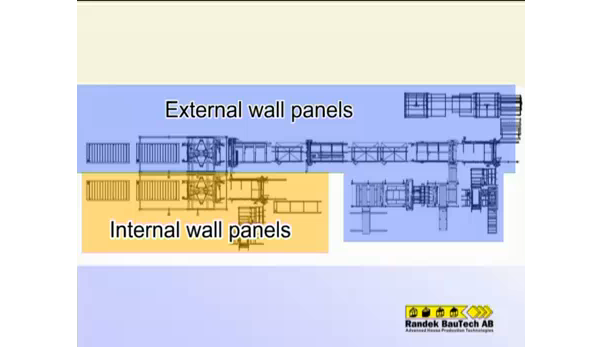 Here is an overview of the line which builds both sheathed exterior wall panels, and interior partition frame panels. 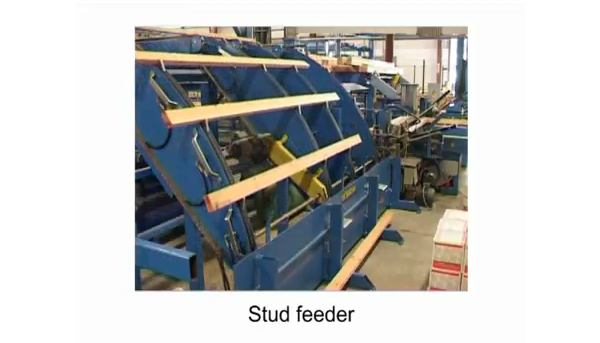 This machine is the stud feeder, which takes a stack of wall studs feeds them into the panel assembly one at a time. The stud is positioned, and nailed into place in one operation, precisely spaced. Its worth mentioning the woeful quality of the American lumber compared to the beautiful clear grained cabinet grade wood used for framing in Sweden. Its shameful. 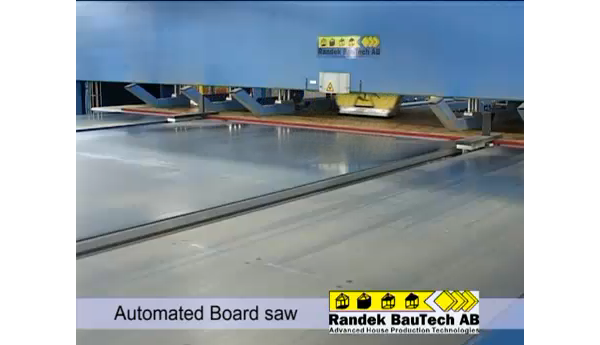 The sheathing is automatically picked from a stack and fed into a saw that cuts the sheathing to the size required for the wall panel. The sheathing panel is then conveyed to the framed wall and positioned. A nailing station applys the nails spaced as required by code. 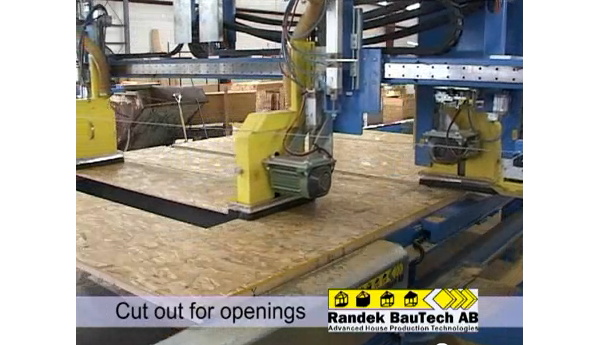 Then finally the window and door cuts are made, and the long assemblies cut into individual wall panels. 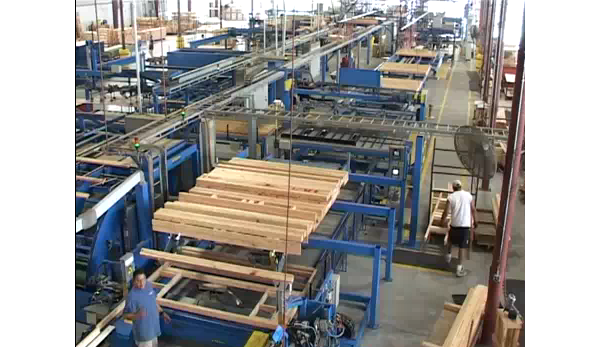 The work is then complete and the unfinished wall panels are stacked for delivery. Its interesting to note that the panels are stacked horizontally here. What this means is they may incur more handling of the panels to reach the ones needed in proper sequence, another small inefficiency. Compared to the Swedes, they store, and ship to site vertically which allows any wall panel to be accessed as needed. Some factories use transportable racks which keep the wall panels vertical, the entire rack loaded on the truck, unloaded at the site, and later returned empty, all in the name of keeping the work flow slightly faster. The closing question is why, if this assembly line is in the US, why don't the US home builders offer a range of styles as do the Swedish factories. First, its only the very biggest and most sophisticated US builders that build this way. In Sweden even small companies use an efficient process such as this that permits them the flexibility to cater to the customer's taste in modern. So yes, the machines are here, but it underscores my earlier point - its not about the automation, its about the process. Chipboard/OSB. Yick! It's funny, a lot of effort for a lot less results. I think that's why everyone that's been commenting has been so taken with the swedes. It's not the process but the end results. Those swedish panels look gorgeous. I'd *love* my house to be built to that standard. Even using the automation and the attendant quality improvement the US panel doesn't look all that impressive. Yes, I suppose once you see the high quality of the houses you may not be concerned with how but only what. But if you are going to advocate for building better houses here in the US we have to be able to demonstrate how they do that. All that said I don't know if we will ever see wood as nice as what the Swedes work with here again. It takes a commitment to manage your forests well, and that's a whole other discussion for another place and time. After these post I've pondered this... what's to stop an architect from working with a Swedish factory and prebuilding a house? You miss the last step in factory assembly, instead putting the finished panels into a container. A 40' container should hold at least 25% of the house if you pick the right design. I'm thinking, maybe the wonderfully simple 0242 Plat house for example. The slab has to conform to the Swedish system but that's workable and if everything is to Swedish standards it looks like that should exceed any building code in N/A. By turning an assembled house into SIPs it should make a project easier and far better quality than currently offered for about the same price as the current standardized local offerings. There are lots of reasons why getting the house made in Sweden is harder than it sounds. Go back to the beginning of the Letters from Sweden post series and read the whole thing. Swedish components are not tested to be accepted in our construction, so no mater that they are better, you can't use them. A better plan is to use the Swedish methods here, which is why we are working with Bensonwood.